Many people visit the Mombasa area for the beaches. But there are other great tourist destinations in Mombasa that should really be on your list of things to see. The Mombasa area is full of Swahili culture and history, as well as some fine marine and nature parks, and why not enjoy everything the coast area has to offer? Many of these attractions can be visited on an organized tour – check with your tour operator or hotel. I think Fort Jesus is one of the best-known tourist destinations in Mombasa, and for good reason. It's a Portuguese fort that is several hundred years old, and has much of the structure still intact. 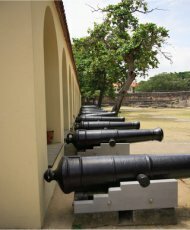 There is a museum on the site that displays artifacts from the fort and illustrates the dramatic history that the area has seen since 1593. The fort is right on the eastern coast of the island in Old Town, and should not be missed by anyone visiting Mombasa. Old Town refers to a whole neighborhood that shows off the old Islamic style and architecture that was the foundation of Mombasa. Though some of the buildings are not in the best state of repair, you can still see some wonderful old structures, buildings and shops. Though the influence is mainly Arabic, there are also Asian, African, British and European elements too. I'd suggest getting one of the personal walking guides (usually available at the Fort Jesus gift shop) to help you navigate as you wander through the area. You can find Old Town in the eastern part of the city. Even if you're in Kenya for the wildlife and the safari parks, you might find this is one of your favorite tourist destinations in Mombasa. Just a short drive north of Mombasa will bring you to the Bamburi Nature trail and conservation area. These extensive walking trails are actually on land that was originally quarried by the nearby Bamburi Cement Factory. You can see all kinds of native wildlife, such as hippos, buffaloes, eland and giant tortoises. Many of the animals are orphaned, and have been raised at Bamburi. Call ahead and get the latest animal feeding schedule, so you can time your visit for the most interesting parts of the day. And you can't visit the coast without seeing some of the marine life parks. The Malindi Marine National Park and the Watamu Marine National Park are part of a larger Marine Reserve, and could be considered one destination. You can see more marine life than I can list here, including fish, birds, crabs, and gorgeous coral reefs. The mainland areas of the parks are home to monkeys, antelopes and giant monitor lizards. These parks are about 100km north of Mombasa on the coast. 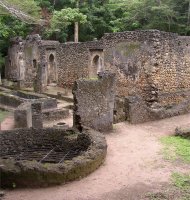 A bit farther from Mombasa – near Malindi - are the Gedi Ruins, the remains of a Swahili town that existed from the 13th to the 17th century. Findings indicate that it was a thriving city that traded with peoples from across the world. In the 17th century, the town was suddenly abandoned and historians still haven’t found out why. These days, the remains of houses, mansions, mosques and cemeteries can be viewed in this well-kept, huge area. Near Malindi and the Gedi Ruins is the Arabuko-Sokoke Forest Reserve. Unlike the typical African safari parks, with large wildlife species, the Arabuko-Sokoke reserve is mainly home to birds, insects, snakes and other reptiles. This spot can also more pleasant place to visit in that it's a tropical lowland forest reserve, rather than the hot and dusty plains parks. I think this list clearly proves that there are more tourist destinations in Mombasa than just beaches. Don’t avoid the beaches – I also enjoy them to the fullest when I’m in Kenya – but you’re only doing yourself a favor if you check out the other highlights as well.